1. Which comic device do you think cartoonist Gary Varvel uses to illustrate his main idea? 2. Explain cartoonist Gary Varvel’s intended meaning. 1. b) irony – when the opposite of what you expect to happen occurs. The sign leads you to believe you will see children playing in the playground or playing some type of game. Instead they are playing on their electronic devices. understatement – A figure of speech in which statements are purposely understated. It may be used to indicate the speaker’s nonchalance (or obliviousness) regarding an often important or otherwise remarkable situation. It often results in irony where, for instance, the speaker’s response to an event does not match how the viewer expects the speaker to react. satire – satire is defined as: the use of irony, sarcasm, ridicule, or the like, in exposing, denouncing, or deriding vice, folly, etc. caricature – A description or characterization that exaggerates or distorts a character’s prominent features, usually for purposes of mockery. For example, a cartoon of a gaunt Abraham Lincoln with a giant top hat, a very scraggly beard, and sunken eyes could be considered a caricature. 2. The phrase “Children Playing” is associated with physical activity: running, jumping, playing ball or some type of outdoor game. 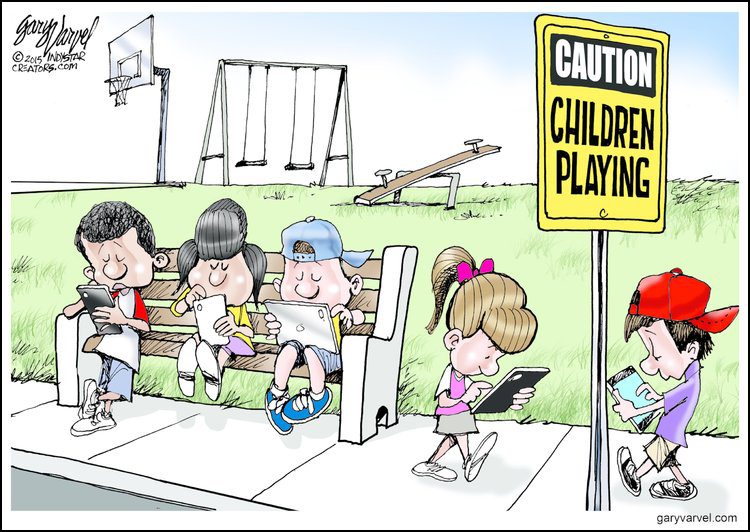 The phrase “Children Playing” has taken on a new meaning with the emergence of tablets and other hand-held game devices. Now children play by sitting staring at a screen.